Print & Pattern is off on its annual summer break for the next couple of weeks and will return for the new season on September 1st. Thanks so much for reading and I hope to see you back again soon. 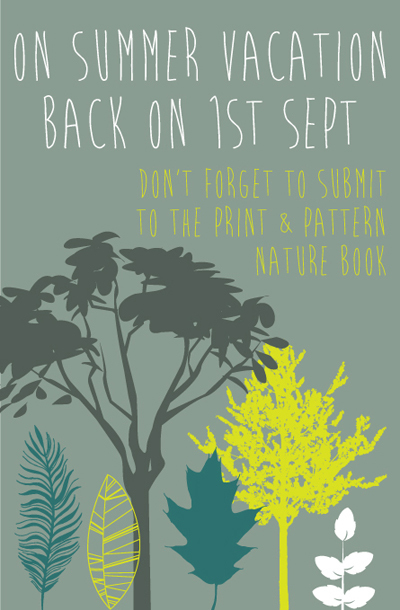 Just a reminder also on the submission for the Print & Pattern Nature book. There is still time to submit your entries - lots of lovely designs have been coming in already - many of which have been floral so I am still on the look out for some other subjects such as fossils, shells, coral, pebbles, trees, seaweed, water, rain drops, wood, grasses etc. More details can be found here. I've been trying to send you my submissions but my emails keep on coming back saying that your inbox is full! I have tried sending them one by one but that isn't working either! Please let me know if there's another way to send them to you? E.g. Dropbox etc. Please let me know if I can send you a download or dropbox link.